For non-text content (i.e. images), in Wordpress, it gets more complicated. Many people use add-ons to manage this OR if there is only one image per post that needs to be custom, they use the Wordpress featured image. Then you can display the thumbnail in your custom post via the getthepost_thumbnail() feature. In concrete5, you can create custom page attributes of the following types via Dashboard > Attributes: Text, Text Area, Checkbox, Date / Time, Image / File, Number, Rating or Select. 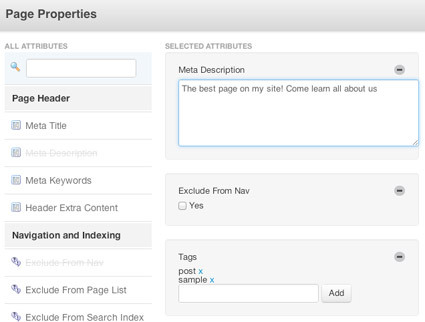 Once you create a custom page attribute, it can be applied to a page by editing its Page Properties. It will also be listed in the concrete5 Dashboard under Pages Themes > Attributes. To make it available while creating pages through the Dashboard, you can add the attribute to a page type via a checkbox interface under Dashboard > Page Types, then set it up for use with Composer, You can also create your own custom single page editing interface.